The Romans relied on their fingers. Later, they soaked small sponges in salt water and tied them to a stick. In the Middle Ages, moss, leaves or old rags had to suffice, though wealthier folks were able to use sheep’s wool. There is no doubt that the original “toilet paper” is a far cry from the hygiene product that we are all familiar with today, which will be acknowledged on the 26th of August with “International Toilet Paper Day”. However, the culture of hygiene has not stopped with paper. It has long since reached the next level: “washing instead of wiping” is the new motto for the most intimate area of personal care. This new way of thinking – prompted by the rising popularity of shower toilets – is changing the world. While the idea of a toilet with a spray and an air-drying function (such as the Sensia Arena shower toilet from GROHE) might still seem a little strange to some of us, in other cultures, cleaning yourself with water after using the toilet is as normal as washing your hands. Shower toilets are particularly popular in Asia. In Japan, for example, they account for 80 per cent of toilets. 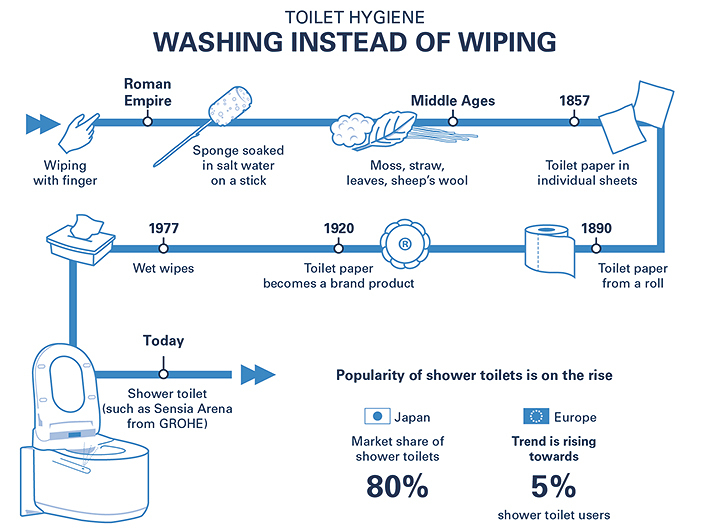 But also in Europe – where the trend is rising towards a market share of five per cent – more and more consumers are abandoning old practices and giving up toilet paper. And it’s for a good reason – since the most natural cleaning agent of all is water. And not only is it more hygienic but it is also gentler to the skin. Shower toilets are regarded as much more comfortable and hygienic than conventional toilets. After using the toilet, small spray arms with a range of adjustable jet types provide thorough cleaning using warm water. Odour extraction and warm air-drying functions ensure maximum personal comfort. Advanced technologies provide a much fresher, cleaner and more pleasant feeling than the use of toilet paper or wet wipes, making for a better, cleaner experience. The type, intensity, temperature and position of the water stream as well as the jet types and cleaning method can be individually adjusted. The GROHE shower toilet can even be adjusted via a smartphone app – smart settings that users appreciate. In addition, shower toilets are not only more pleasant to use; they are also more environmentally friendly, as toilet paper is no longer needed: a clear case of washing instead of wiping! The “end of the roll” is also gaining popularity in this country. 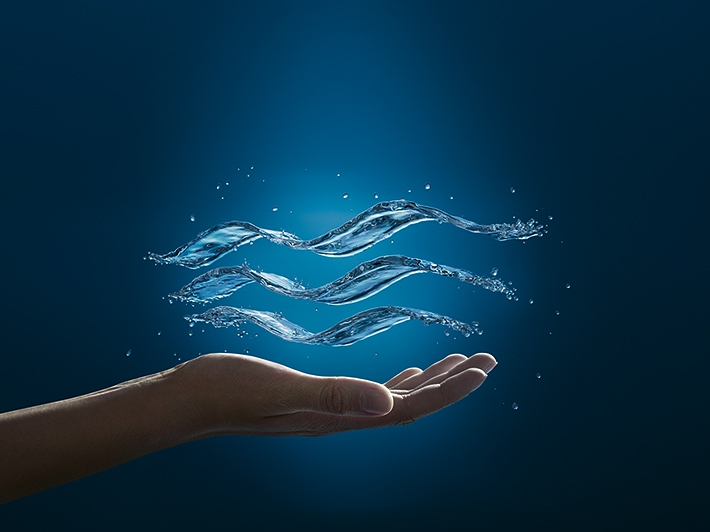 One shower toilet manufacturer that is particularly helping to drive this change is GROHE. Just last year, for example, the company launched the Sensia Arena on the market, a model that meets the design requirements of bathrooms in Europe. While previous models catered primarily to the Asian market in terms of their design and technology, the new Sensia Arena shower toilet is surprisingly minimalistic: intuitive to use, with a clear and simple design. An innovative surface in the form of cleaner, virtually germ-free ceramic and an automatic cleaning function for the spray arms probably make this model the cleanest place in the world.